If golf is your favourite game, then you must definitely come here. 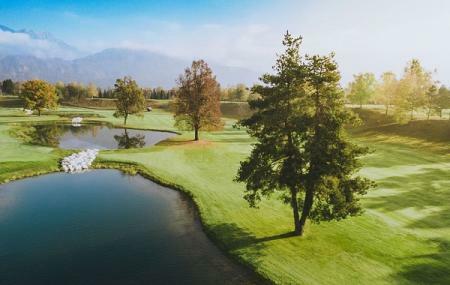 Surrounded by Slovenian Alps, this golf course is about 4 kilometers from the city center and counts as one of the oldest, most beautiful golf courses in Central Europe. Initially established in 1937, the place was again renovated in 1972 during which it was equipped with more facilities. The entire system consists of 18-hole King’s Course and the 9-hole Lake Course providing the visitors with varied choices. A great place to come with family and enjoy some good time playing golf on its lush grounds. Being the countryside, the serenity and calm serve as a perfect diversion from the hubbub of daily life. A must-visit for golf lovers and sports enthusiasts. Fantastic LOCATION + SCENERY. Top class golf here with great facilities. Deserving Top 100 status by Golf World UK magazine. Now with 10 + 4 rooms with great views/amenities. Not far from stunning Lake Bled. Only 1hr 50mins flight from London. Perfect for a short break actually. Highly recommended. Check it out. Beautiful wiew. You can go there just to drink coffee and enjoy the wiew. Dress nicely. They don't aloud jeans. New layout is good and the course rewards good golfers although some trees needlessly removed. Ridiculously overpriced. Many nearby courses in Austria, Italy or Otočec in Slovenia are better value for money and also offer an equal quality course. Renovations on the building have totally destroyed the early 20. Century feel that was truly ROYAL.